Sitting in a tree stand with a Kermit the Frog doll is not what I would call a normal day for me. The trail cameras set up on the bear bait indicated that a cinnamon colored bear had been coming to feed at about 8:30 pm. With this information I set myself in the tree stand at about 5pm, giving me and the bear plenty of time in either direction. When I showed the pictures of the cinnamon bear to my kids they started calling the boar “Fozzie”. The boar was the same color as the Muppet character. When I climbed into the stand I noticed a green arm sticking out of my backpack. I investigated and found a 14 inch green doll. So there we were, Kermit and I, hunting a cinnamon bear my boys nicknamed Fozzie; silently waiting for a bear to saunter into the bait about thirty yards in front of me. The humor did not escape me. One rule aboutIdahobear hunting that I have a little trouble with is that the wonton waist laws do not apply to the bear meat. Essentially, a hunter can shoot a bear and then leave everything but the skull and hide behind. The meat will be eaten by other creatures, surly, but the whole notion of killing and not eating a big game animal is a tough pill to swallow. 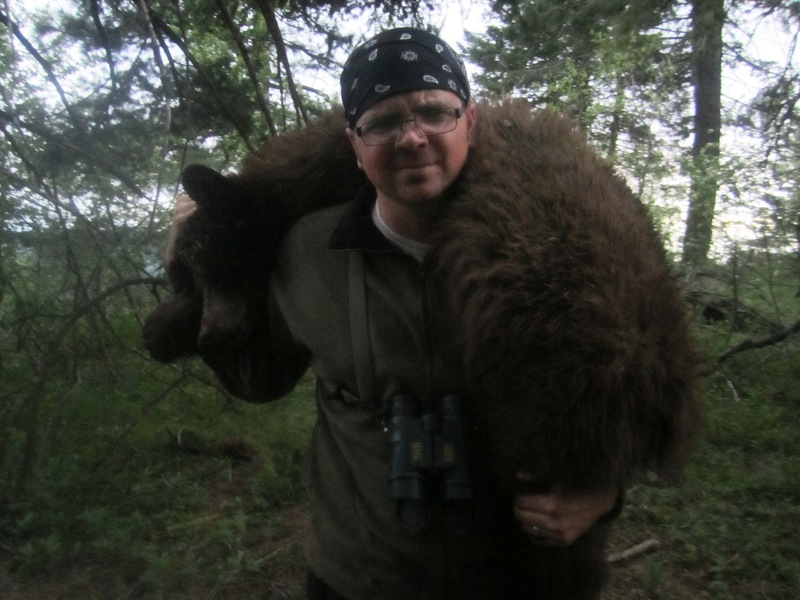 Bear meat also has a few problems of its own according to naturalist and author Steven Rinella. He notes that bears tend to have this little problem with trichinosis, the disease that until this year the FDA thought pigs would give you so they asked that you cook your pork to well done. Rinella notes that “In Montana’sLincolnand Sanders Counties 100% of the bears tested over six years of age have tested positive for the parasite.” The bears get the disease by eating trash that contains the round worm Trichina Spiralis.